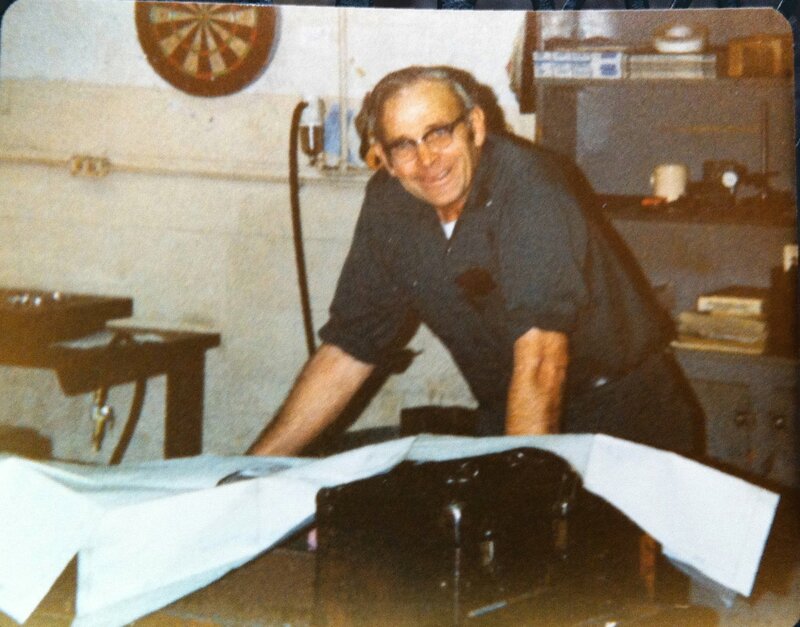 Andy Corell working at his other job — as a machinist. Circa 1975. I’ve grown accustomed to seeing my mother on a regular basis. Like anytime I catch a glimpse of myself in a mirror. She’s with me wherever I go, perhaps even more closely since she died in 1998. What’s more surprising to me is seeing Dad. Not in a mirror, but in the expression of a friend here, in a chuckle or in the barely noticeable limp of a hard-working man walking past me. He’s been gone even longer. He died in 1990. But by all accounts, he got to Haiti before I did. I told the story again today. I enjoyed lunch with two farmers from high in the mountains above the Artibonite River and a colleague who lives near me in Port-au-Prince. Andre Ceus and Lormè Previlus came to the capital city on business, and the four of us caught up at my house for lunch. Fabienne asked me about my home in Virginia, and I explained that I grew up on a farm in the countryside of Virginia, in a great valley. I went on to tell them that my father had been a farmer, even though he had been wounded in World War II and lost his right leg below the knee. Farming was his love, so he worked hard to continue the way of life he’d been born to. Dad’s gardens encompassed a good quarter acre. At least that’s how large it looked when I was 10 and it was summertime and I was expected to pick beans or pull weeds and the neighbor kids were watching television. I nodded, taken aback just a bit by the sound of my father’s voice speaking Creole. Dad worked a full-time job and farmed on the side. Money was tight in the ‘60s and ‘70s. That garden provided much of our food during the summer, and we enjoyed potatoes from it long into winter. “Your father is smiling at you now,” Fabienne said with a smile of her own. And I had to agree. My life’s calling has brought me to Haiti where I work with men like Andre and Lormè and Papa Luc, all of them farmers who depend on their land to provide food and extra income for their families. Like my father, they cherish the land they toil. Like my father, they keep their spirits up even in the toughest times by telling stories — and listening, too. And like my father, to them, family and farming are one in the same. Lormè isn’t the first to bring my father to mind here. Papa Luc Celestin and his family hosted me for the first month I lived in Haiti. He, too, farmed, worked in carpentry and walked with a limp. “If your father was alive, would he visit Haiti?” he once asked me. And I would. And he is here. And he is smiling. And you know what, Dad? So am I. I am eating from gardens as beautiful and as essential as yours. I am so grateful for all. Accompaniment is about more than sharing the road. Accompaniment is about sharing our lives, our gifts and hardships toward a more complete life together. I’m new at this missionary business. Feeling called and doing the work of the called are worlds apart. Just like everything I’ve learned about my life and this new, astounding, baffling, magnetically attractive culture in which I’m living. We are here to be with, not to do for. We come to walk alongside our friends here. We come to share our lives and our stories and find common ground. A recent trip took us (seven people from the Presbytery of the James, two drivers, a translator and me) far into the mountains where we met with some of those friends. We had many excellent, deep conversations, both among ourselves, (we foreigners) and with the leaders and members of the farmer organizations we spent time with. We talked about healthy giving. We talked about ways to help without hurting. We talked about these books we’ve all read, like Toxic Charity and When Helping Hurts. We talked about finding ways to accompany the people here in Haiti. I used that words so much I finally looked up the definition. You know, just in case I was WAY off the mark. The first definition concerns a musical accompaniment, as in adding the piano to the vocal parts. The second had to do with complementary additions — as in cooking. Then, I found this. And I’m sticking with it. Because, dear Inigo, I think we’re onto something. Check out definition No. 3. MusicA vocal or instrumental part that supports another, often solo, part. Something, such as a situation, that accompanies something else; a concomitant. Something added for embellishment, completeness, or symmetry; complement. Yes! It is about completeness. I live and work in Haiti not to be the sole helper. I am here to be completed. And, if you should come to be with, you will be on that path as well. Because God is in this mix, as always. He is here for the journey, for the discussions, for the hard questions. And He is here when we visitors exchange funny looks with our hosts because we often don’t understand one another. And only God will complete any of us. The most excellent, conceivable part is that he puts us in touch with one another toward that end. Today is Ash Wednesday. The beginning of Lent. And this day I begin to practice mindfulness. Part of that is examining the words I use, especially in nurturing beautiful relationships with my family and friends across a great sea and beyond a great cultural divide. Look here for more of this journey.